There comes a time when you know you're ready to close door for the last time and move on. To turn the key and drive off to pastures new. And I've come to realise that such a time has come for this blog. There's part of me that doesn't want to let go. After all, this space has been my home and the place where my family and I have grown up, working out how we manage my ever-increasing enthusiasm to reduce waste. It's also been the meeting point for many new friends. Strangers, who have since become good friends. We've laughed together, dined together, attended events together and naturally talked rubbish. But I've been increasingly conscious that I don't spend much time here these days. Not since the team and I have built a much bigger 'house', the Rubbish Diet website, which has become a worthy home to the online challenge and HQ for community support. That's where you'll find all the latest updates about my exciting rubbish adventures, all that's happening in West London plus lots of tips and advice shared by our fantastic team. 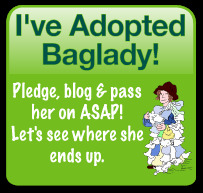 For me, it no longer makes sense to have a blog and a website that share the same name. It feels a real milestone to abandon this old thing. It shows just how much The Rubbish Diet has grown up. And I hope as I wave goodbye here, that you'll continue to follow me and the team over at www.therubbishdiet.org.uk. We've got lots of exciting new things to announce in the autumn, so please do watch that space. But, I have some other news too. This space grew out of my passion for blogging and my curiosity to learn. explore and document stuff that matters to me, whether it was family, the world around us or simply as an excuse for everyday self-expression and a chance to get something off your chest. I am still a random blogger at heart, so I've built myself a new personal space. It would be lovely to see you there. It's all fresh and free from my old clutter. You can find it at www.karencannard.wordpress.com. It's been six and half amazing years. To think that I thought this rubbish stuff would only last eight weeks. Ha! What did I know! That's the thing with rubbish, it has that capacity to fire up a troubleshooter's imagination so bloody easily and never let go. I want to say a massive thank you to everyone who's dropped by and supported me and my rubbish ideas over all this time. You've been wonderful and have helped make some great things happen and create some fantastic memories. There's still lots to do, so I hope this isn't really goodbye and that I'll see you in either Rubbish Diet HQ or my imaginary writing studio very soon. Let the rubbish adventures in those bins continue. Rubbish pleasures: Can you find happiness in reducing waste? I'm not sure why I need to qualify it with 'lately'. I'm always pondering. Pondering is something I continuously do. And the thing that's got my braincells sparking this time is the subject of happiness and how more and more people who we nudge along through The Rubbish Diet are expressing a real sense of pleasure at the end of it. "When you lift it up to see such a little bag after two weeks it's absolutely a joy." said Graham Heap, whose family took the challenge to reduce their waste in just two weeks. He added "I never ever thought that the size of my rubbish bags would put a smile on my face." I raised this point recently at a TEDx talk that I gave at Cambridge University earlier this month. My talk was about how as individuals we have the power to revolutionise waste. Helping to innovate the economy through recycling more, supporting our local communities by paying more attention to reuse opportunities and how when we focus on reducing what's left in our bin, our creativity excels in finding new solutions to abate waste. And I ended with Graham's quote, whose family had to quickly develop new routines, embed whole new habits and reorganise their recycling very differently in order to reduce their waste so drastically. For many, that would seem a total palaver. Yet for the Heaps, the positive results and personal successes outweighed any former perceived hassles. The Heaps aren't the first to express such surprise pleasure at reducing their waste so drastically. I'd felt the immense rewards myself back in 2008 after I did that Zero Waste Week and there will be many others who had done so beforehand too. But it's only recently that I've started thinking about this feel-good factor in more depth and it's an area that I'd like to understand more. For six years I've been talking rubbish and helping people take steps to reduce their waste and I'm going to carry on doing that. However, where I was once just happy with the results of people's Rubbish Diet endeavours, the more I witness individual's and community success stories, the more intrigued I am to understand some of the science behind these unexpected 'rubbish pleasures'. What really drives people like myself to strive towards a massive waste reduction target during a Zero Waste Week? Is it because we are natural goal-seekers who love beating targets? Is it because we feel accountable to whoever has set the challenge? Is it that fantastic feeling when we exceed our own expectations? Is it the surprise that we discover in ourselves or possibly the innovation beyond our bins that captures our imaginations? Perhaps it's the positive sense of well-being brought by being an active part of the waste solution after years of being part of the problem? Perhaps it's the joy of saving money that we would have once thrown away as rubbish in our bins? Or perhaps it's enjoying our belongings for much much longer? I know for one thing, there is an amazing sense of satisfaction in not having to put out the rubbish bin so often. And there lies a happy moment at its simplest. From practical reasons to those that are more difficult to define and reach, I know that everyone's level of pleasure will be different and will be dependent on their individual motivation. So, if you're happy to share your story and discuss with me your own experience about how it feels having reduced your waste, I'd love to hear from you, either through the comments below or by email. Equally, if your experience has led to opposing feelings, I'd love to explore these too. I'm now crossing my fingers that taking The Rubbish Diet hasn't resulted in a household rift or - heaven help us - a divorce!!! And if you've never done The Rubbish Diet before and fancy testing out some rubbish pleasures of your own, you could sign up to the challenge here. But don't expect it to be a totally easy ride. Most people have various hurdles they have to overcome, many of which are often beyond our control. Maybe that's the true source of rubbish pleasure. In beating down those barriers, whatever they might be. Below is a copy of my latest column for the Bury Free Press, which is published monthly. If you've been pondering how your organisation could make better use of Reuse and push unwanted items further up the waste hierarchy, even helping your local community, then do read on. A few weeks ago, I managed to catch up with Daniel O’Connor, the founder of WARPit, who was making a rare visit to Suffolk. I’ve been following the organisation for some time and was I curious to find out more about successful schemes that have been implemented around the UK. 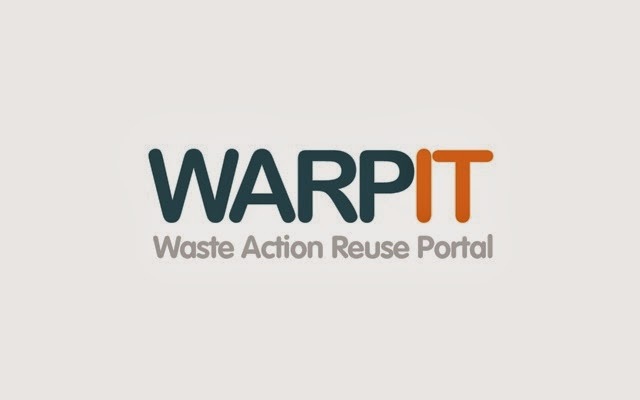 In a nutshell, WARPit is an online resource redistribution system that helps organisations and departments to lend or give away surplus equipment to internal departments or external organisations that actually need it. And so far the company has helped divert over 132853kgs of waste and save its clients over £787,000 in the process. Dan, whose background lies in waste management, created the first version of the sharing tool in 2006, using an email list like Freecycle. However, it did not offer enough control to satisfy waste and liability laws, which are a key part of an organisation’s Duty of Care. He also admits it was also ‘a bit of a scatter gun approach’. So, he started to develop bespoke software in Jan 2011, which hit the market three months later. Now, with 70 customers around the UK, WARPit’s database & network is helping managers save procurement and disposal costs in all sorts of organisations that vary from SMEs to local authorities, schools, colleges, universities, NHS trusts, government departments and charities. Resource distribution systems for organisations aren’t particularly new. There have been many implemented around the country using basic technology such as bulletin boards and email rings. East of England’s free Eastex network has also been in place since 2004, but has gone a little quiet in recent years. So what’s so different about WARPit? From a user-perspective it looks very streamlined, with easy-to-use photo-loading and comprehensive listing facilities. However, it’s the links to facilities management and corporate procurement procedures that may provide a real key to its success. And organisational savings aren’t to be sniffed at. During its three month trial of using WARPit, the university saved £4,129 in waste disposal and procurement costs. Elsewhere, WARPit’s partnership with Northumberland County Council has just won a Society of Procurement award for cutting the local authority’s purchasing costs by over £50K. Also from a sustainability perspective, in addition to tracking the financial savings of redistributing surplus equipment, WARPit’s management reports allow organisations to analyse their carbon savings for CSR reporting too. But what I really love about WARPit’s potential, is the opportunity to create reciprocal resource sharing networks between organisations in a town, across a whole county or indeed a whole region. And this raises the bar for developing strategic partnerships within local or regional economies. For example, Sunderland City Council’s partnership with Voluntary Action Sunderland - which has recently been recognised with a Compact Voice award - passes on surplus resources within the council and to third sector organisations and schools in the city. The effectiveness of the system increases as more organisations join. With more resources circulating, the system serves its community better, making all partners more resilient. Before leaving, I asked Dan about his most rewarding experience since starting WARPit. Apparently, it was rehoming 30 pairs of unopened Ralph Lauren brogues, left by an Olympic basketball team who were staying at the University of East London. Now that’s what I call a really huge challenge, especially as they were size 12-18s! EXTRA UPDATE: Please note that WARPit is free for charities. Other subscriptions are dependent on organisation size. Launching Suffolk's very own Waste Reduction Hot List! Being voted into Resource Magazine's Hot 100 was indeed an honour last week. I'm still buzzing with excitement! Thanks again to all who voted and also once more to everyone who's supported The Rubbish Diet and my ramblings. It has left me with my own burning question, and that's to uncover the Who's Who of movers and shakers closer to home, i.e. the people who make a real difference to reducing the county's waste across Suffolk. WHO'S YOUR LOCAL WASTE REDUCTION HERO IN SUFFOLK? It could be someone in your family who's always repairing things, a local volunteer who's passionate about sharing recycling expertise or someone who's succeeded at their own personal waste reduction challenge, or on a more formal setting, someone who works in waste who's striving to make the most of recycling. It may be a teacher who's constantly finding new ways to reduce waste at school or a colleague in your business. It could be an engineer/designer who's developed a great product that helps to reduce waste. When it comes to ways to reduce waste, the list is endless. SO WHO'S ON YOUR HOT LIST? Exclusions: Please do not under any circumstances nominate that blogger from Bury St Edmunds, who talks rubbish incessantly. Her ramblings and rubbish escapades take up enough of my time. Yesterday, I had the privilege of attending the Kit Strange Memorial Lecture at the Houses of Parliament. It was the inaugural lecture delivered by Steve Read from the Somerset Waste Partnership, in honour of the late Kit Strange who, as director of the Resource Recovery Forum, pioneered the idea of waste as a resource. I never had the chance to meet Kit, who died unexpectedly in 2011, but from the warmth, memories and respect demonstrated by Steve Read and many of his peers, it was clear that he'd had an incredible impact on the waste sector in many ways, which as householders detached from the policies, strategies and innovation, we naturally take for granted. Over the last six years since I became curious about waste, I have found myself in a unique position as a blogger in seeing how this industry works, meeting influencers, policy makers, waste management companies, researchers, campaigners, designers and technological innovators that are directing the old dinosaur of a single stream landfill culture to one where our rubbish is treated as a valuable resource that is fed back into the economy. Many attended the lecture yesterday and it was a great opportunity to catch up with just some of the people who are continuing to develop the resource economy through recycling, organics and redesign for reuse and repair. To coincide with the lecture, Resource Magazine also announced its highly anticipated annual Hot 100 of influencers within the Resource sector. Kit Strange was a former winner of his inspirational work. It was great to see Iain Gulland, Director of Zero Waste Scotland heading up the this year's list. I've heard Iain speak on a number of occasions about improvements to Scotland's recycling infrastructure and his vision for and practical steps towards Zero Waste. 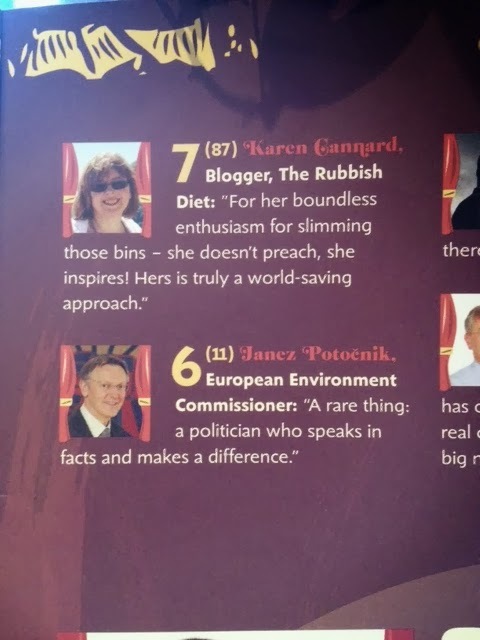 In a list that features such high calibre professionals and visionaries from across all sectors of the waste and resources industry, you can imagine my delight when the Top 10 was announced and I discovered I was featured at No. 7. I'd like to thank everyone who voted. It feels an honour to be there and was a total surprise. For me, it represents the relevance of capturing peer-to-peer enthusiasm, community based knowledge sharing and empowering people with new purpose and motivation to think differently about waste. And I'm chuffed to share the platform with my colleague Rachelle Strauss of My Zero Waste and National Zero Waste Week, who was listed at No 11. In his lecture, Steve Read indicated that consumers and citizens are often the missing stakeholders in the waste and resources sector. And it is true, for both the engaged consumer and the detached. Yet we are a vital ingredient that's needed to help the industry maximise its efficiency. How much we understand the impacts and how we choose to use our bins has a direct influence on the country's economy. I recognise that much of this depends on the media and I continue to strive to drive media interest, develop audience engaging formats and push for greater aspirations among communities. Hearing of the immense commitment, achievements and drive of people like Kit Strange and other professionals always increases my vigour to keep tickling people into increasing their support and contribution on the homefront. Huge thanks to everyone involved in organising yesterday's event. It was a real pleasure to be there. And I did my bit for food waste too. Thanks to the caterers and organisers for encouraging delegates to take away the leftovers in compostable containers. A resource-focused event at its very best. Farewell 2013 and hello 2014: Reflecting backwards and pondering forwards. I hope you had a great Christmas and are are looking forward to the new year. If you haven't done so yet, there's no better time to sign up for the Rubbish Diet Challenge and make it your new year's resolution, You'll be in great company, with 100s of people signing up by the day, thanks to The Rubbish Diet being the Campaign of the Week at Money Saving Expert. It's been an amazing year and probably one of the most difficult from which to choose a particular highlight! January kicked off with Wiltshire Wildlife Trust running the Rubbish Diet, which saw great results from their dieters and resulted in meeting the fabulous bloggers who took part, including Sarah (Everyday life on a shoestring) and Jen (Make and Mend Year). Of course, running all through the year was the enormous team effort to implement the Rubbish Diet in Suffolk, Shropshire and Powys as part of the Nesta Waste Reduction Challenge. Sadly, we didn't win the £50k but it was brilliant to be one of the finalists and come out of the process with an established team, a purpose built website and a radio production toolkit. Congratulations to the Gleaning project which won - a worthy project that helps rescue surplus produce from our farmers' fields for distribution to charities. And dotted throughout the various campaigns were great opportunities to visit places such as San Francisco - as part of the Zero Waste International Alliance Dialog - to learn about how the city attains such a high recycling and composting rate at 80% and hear from practitioners from around the world about waste at different levels, not just recycling but from a humanitarian perspective too. There was no rest for the wicked even during the summer. A call from ITV brought an opportunity to trek to the North West to help the Heap family reduce their waste. To see their negativity towards recycling turn towards enthusiasm and determination was utterly brilliant. They soon reduced their landfill by 95%. When you catch the waste reduction bug and see what's possible, it's proof that slimming your bin can really be contagious. Towards the end of the summer I had the chance to meet Jen and Grant, more blogging pals from the Clean Bin Project in Canada, and send them to several of my favourite zero-waste hotspots for their UK film tour. They had a great tour and if you haven't seen it yet, the Clean Bin movie is one upbeat documentary about reducing rubbish that you really shouldn't miss. The second half of the year brought even more excitement with Rachelle Strauss' 6th National Zero Waste Week building on the successes of last year. If you took part and thought that was good, just wait until you see what's planned for next September. The last few months also saw waste professionals taking the Rubbish Diet challenge, which brought an interesting focus on testing whether they could 'practise what they preach.' A highlight was Viridor's Dan Cooke's tale of working out what to do with an old wetsuit and CIWM Wales' Rebecca Colley-Jones challenge of turning her unexpected offal leftovers into a haggis. I hope they'll blog about them soon, especially as an insider's view offers a fascinating perspective. 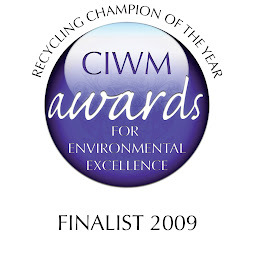 The BBC Radio Suffolk Rubbish didn't win the CIWM communications campaign award, but it was great to be in the finals. Here in Suffolk, presenter Mark Murphy's and I had loads of fun talking rubbish and listening to residents' stories, united in a single mission to reduce the county's waste. That was a real highlight, as was interviewing and recruiting our first Bin Doctor for a campaign further afield in Harrow, not to mention joining the Board of Trustees at ReusefulUK. So what's for next year? With fantastic partners and a great team in place managing The Rubbish Diet joint venture, I hope for the website and local engagement projects to go from strength-to-strength. I'm already looking forward to Wiltshire Wildlife Trust bringing the challenge to their local projects for the second year running as well as The Rubbish Diet taking to the streets of Harrow this January. Our Harrow Bin Doctor, Debra, is already in place working closely with our community engagement manager, Ali, and has been talking rubbish with local community groups. With most Rubbish Dieters having reduced their waste by 50% over the last 12 months, I hope for much more of this in 2014 and I am very excited about where The Rubbish Diet will travel this year, especially as more and more supporters sign up around the UK. From a local perspective in my part of Suffolk, I want to continue to research and highlight the fantastic solutions that are being put in place by businesses and communities to reduce waste, to empower those who want to follow suit. There's lots of potential to connect interested individuals and organisations through a reuse culture alone. My other focus is on the innovative, motivating and entertaining aspects of waste reduction in a mission to bring a renewed vigour of interest in the topic to our TV screens, showcasing the possibilities and realities of what can be achieved. There is so much more that our media can do to empower the nation and highlight issues where it's needed too. And as for industry, I want retailers and brands to take an even closer look at the rubbish they sell us and in cases where hard-to-recycle plastic is used for cosmetic rather than protective reasons, redesign it for easier recycling. Starting with something as simple as the ubiquitous plastic gift card would prove an instant hit. If iTunes can switch to a card-based alternative, hopefully other gift cards will follow. There is so much more to tackle than small cards but I also believe that what we might perceive as small things are also worthy of attention. There is great value to be had in not forgetting that old saying 'Look after the pennies and the pounds will look after themselves'. Attending to the tiny details can often lead to huge change. I hope that that 2014 will bring more exciting stories and innovations that will inspire more change. Against the tide of government cuts and news that recycling rates that are flat-lining, both individual action and community support is going to be more important than ever. I know my ambitions for next year are high as is my level of confidence in people's abilities to make a significant reduction in our country's waste. But I also know that by thinking big and with the right support in place, many things are possible. So thank you to everyone who has made 2013 such a whirlwind of amazing waste-busting adventures. Here's to whatever 2014 will bring. Bins can only get better! A Rubbish Diet update. Hello. Remember me? It's been a while since Zero Waste Week, but I am still here. Well, here, there and everywhere. Putting one foot in, one foot out, doing the hokey cokey and shaking it all about. Lots of great things have been happening in the world of The Rubbish Diet recently and to keep you in the loop here's a quick run down! If you haven't seen the new website lately, please do pop over to www.therubbishdiet.org.uk where the team has been busy populating it with new stories as well as a growing list of top tips. If you still haven't signed up to do The Rubbish Diet Challenge, now's a great time to see if you can have a go at slimming your bins by Christmas. What a great way to end the new year! It's with great excitement that I can announce that The Rubbish Diet is being rolled out in Harrow, West London, and we have appointed a Bin Doctor to help make that happen. Debra Alexis has already taken up the post and you can find out more about her here. If you live in Harrow and can help spread the word about the Harrow Rubbish Diet challenge that's launching in January, please do get in touch with Debra. Excitement is also building over the prospect of the CIWM awards this Thursday, where the BBC Radio Suffolk Rubbish Diet is shortlisted for an award in the Media Communications Campaign category. I'm travelling down with presenter Mark Murphy and his production team that championed the campaign. It would be brilliant to bring such a prestigious prize back to Suffolk and celebrate once more the support and good work of all the participants. Hot on the heels of the awards is also next week's NESTA interview, where the team behind The Rubbish Diet joint venture, will be making our final pitch for a £50K prize to invest in rolling out the diet in more communities around the UK. Imagine that! It would be simply awesome. It was our finalist position in NESTA's waste reduction competition that funded the development of our website and the Rubbish Diet trials in Suffolk, Shropshire & Powys, so the chance to support even more communities would be an amazing opportunity. Not directly linked to The Rubbish Diet, but still very important to me, I have recently accepted an invitation to join the board of trustees at ScrapstoresUK, an umbrella organisation and charity that supports the work of Scrapstores and resource centres, which reuse surplus and waste resources from retailers and manufacturers as supplies for children's art & crafts. Scrapstores are always looking for more suppliers of materials as well as volunteers. More information at www.scrapstoresuk.org. And last but certainly not least, having received an increasing amount of interest to contribute to media productions on both radio & TV, I have taken the huge step and signed with Sue Rider Management, a fantastic agency that is now working with me on some exciting developments. While I swoon in awe at the agency's other clients, I am doing my utmost to remain grounded between bouts of running around with great excitement at the prospect of even more 'rubbish' adventures to come. I think the words to use are: watch this space. I think the theme of this update is most definitely one of great excitement about all that's happening, but amidst this I am naturally still keeping an eye on what's happening in the wider world of waste. If only I'd had time to blog after the RWM exhibition in September, I'd have applauded some of the great work that the Co-operative is doing to backhaul its recycling from the network of small stores to its distribution centres. And as for Ann Summers, the company's 50 Shades of Waste presentation was a real revelation - and a very pleasant one at that! And what about the latest news from Tesco eh! Finally, a supermarket publicly announcing their levels of waste in fresh produce and committing to reduce it. And finally our ITV family, The Heaps, who were recently featured on Tonight's Throwaway Britain, are maintaining their slimmer bin at 95% of its former self. Now that really is great news! I shall indeed be back soon with more. Thank you as ever for following and supporting the adventures of The Rubbish Diet and this Almost Mrs Average. You are lovely!